Additional facilities have been added to the crash test capabilities of Millbrook in the UK for performing small offset and roll over crash tests. 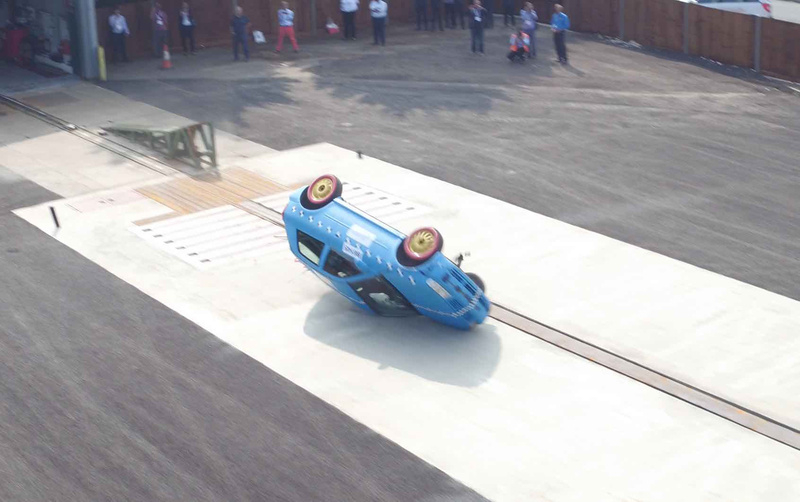 Millbrook Group has expanded its crash test facilities and can now perform a range of roll over and small offset crash tests for its customers, in compliance with US and EU test methods, from a new outdoor facility at its Bedfordshire, UK site. Supplementing the site’s existing capabilities, the corkscrew roll over testing facility enables customers to test vehicles for a variety of outcomes, including roll over protection, occupant ejection and roll over detection – used for sensor calibration critical for deployment of safety features such as airbags. Ramp profiles and test speeds are customisable to test for roll and non-roll outcomes, allowing customers to see the safety capabilities of the vehicle and how to develop countermeasures to suit. Bespoke testing scenarios can be developed to suit customers’ requirements, while more common, off-the-shelf testing capabilities include: ditch fall over; FMVSS 208 roll over; gravel, soil trip roll over and kerb trip roll over. In addition to roll over testing, Millbrook has added small offset testing to its capabilities. Specifically designed to suit IIHS (Insurance Institute for Highway Safety) regulations used in the USA, the facility assesses vehicles when impacting a rigid barrier at 25% offset. Carried out at 64km/h, the test is designed to drive further improvements in occupant protection. Millbrook has included the capability to provide underside camera footage, while the small offset facility also has the ability to test both left-hand and right-hand impacts, meeting the very latest level of the test protocol. This level of flexibility and extensive camera footage are features believed to be exclusive to Millbrook in Europe. Following the successful completion of several commissioning runs and facility testing, the first customer tests have now taken place. Having the new facility up and functional means that Millbrook is able to provide customers with a complete range of vehicle testing scenarios, enabling a manufacturer to test and develop its vehicles as necessary before they reach the end user.